During the years the U.S. and its satraps in Poland and the Baltics fought the Nordstream 2 pipeline it was always apparent Germany was in the driver’s seat. It was also apparent that this would be the wedge issue that would ultimately force Germany to pursue independent policy from the U.S.
Nordstream 2 is and was always a reaction to the U.S.’s meddling in Europe’s energy policy which this cycle of began with the scuttling of the South Stream pipeline in 2013. From the EU’s perspective changing the rules under which South Stream would operate after the contracts for it were signed was a way of gaining leverage over Russia and Gazprom. So too was the help protesters in Kiev received to overthrow the Yanukovich government from the U.S. and the EU. That operation was meant to put the Ukrainian pipelines under EU control where they could dictate terms to Gazprom and choke the profit out of its gas deliveries. It would also advance NATO and the EU to Russia’s western border and there was to be nothing Putin could do to stop the U.S. from putting nukes targeting Moscow there. Too bad for them it didn’t work out that way. This is one of the reasons why the U.S. is so incensed with Russia and Putin over Ukraine. It’s why his chickenhawks in his cabinet and John McCain pushed so hard for sanctions and weapons support to Ukraine before the dearly-departed Brain Tumor killed him. Obviously, the other was being stymied in taking over Crimea and forever losing the opportunity to grab the port at Sevastopol. Because German Chancellor Angela Merkel just announced a long-delayed LNG terminal will be built by Germany with state assistance. You see, LNG or liquefied natural gas, isn’t really that profitable for European customers, otherwise this import terminal would have found enough backers in the private sector. So, Merkel announced a small concession to Trump by throwing some money at some LNG import terminals which any supplier can and will use. This announcement was immediately spun as a win for President Trump by Oilprice.com’s Tim Daiss because, well, reasons. The rest of the article is boiler-plate Russia-baiting and bad economics, but that’s to be expected from American writers at Oilprice. It’s similar to the Russian writers there who overstate Russia’s advantages. That said, there are always nuggets of truth buried in the manure. Despite Daiss’ bias what he fails to mention in his MAGA-enthusiam is that Germany making this announcement is far more significant than Merkel’s perceived kowtowing to Washington. Politically, this cost Merkel nothing. What this admits is what Gazprom deputy chairman Alexander Medvedev said back in May. 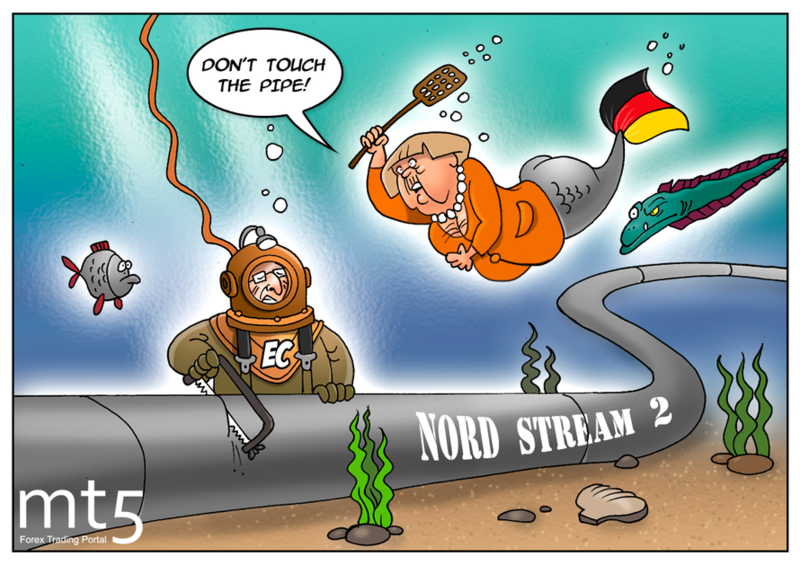 Everyone should forget about fighting Nordstream 2 because Germany will need Nordstream 3. Output is falling in Norway and Scotland, too. According to a recent report by the Oxford Institute of Energy Studies, absent the discovery of new fields, Europe’s gas production is set to decline from 256 billion cubic meters per year today to 212 billion cubic meters per year by 2020, and 146 billion cubic meters per year by 2030. Amid falling domestic production, demand for gas is set to go up, as European countries close down old thermal coal power plants, and Germany prepares to shutter its nuclear power plants by 2022. German NPPs, it’s worth noting, once accounted for nearly a quarter of the economic giant’s power consumption. “And no, no American, Qatari or even Russian LNG supplies will be able to replace these volumes,” Lekuh stressed. “Such supplies are simply a triviality when compared to the price of pipeline gas, and there are currently no technical solutions to this disparity. And while it may be possible to raise gas prices for the public, for Europe’s industry, a predominance of liquefied natural gas simply means death. The rise in the price of energy-intensive production would result in a lack of competitiveness in global markets,” the observer noted. So, yes, Germany building LNG import terminals is an opportunity for U.S. companies to sell Germans some gas. But, it also means that Novatek can sell LNG to Germany from its massive Yamal project on the Baltic Sea and still undercut U.S. deliveries. At the same time, the Saudis are ready to buy a $5 billion stake in Novatek’s next project called Arctic 2 in Siberia. Well, it could be a bribe to keep the Russians quiet on l’affair Khashoggi but it more likely about location. Transport costs matter in the LNG game. Period. The cost to move the gas from one place to another is big driver of final price and profitability. So too does the currency arbitrage. And Trump’s own belligerence towards Russia to weaken the ruble while driving oil and gas prices higher is only making the price discrepancy between Russian and U.S. gas worse. Also, if the U.S. was winning this war of sanctions and tariffs and forcing the Germans to heel, then why is Trump folding on kicking Iran out of the SWIFT system of international electronic money transfers? Could it be because SWIFT’s threat as the financial nuclear weapon it once was is now easily shot down like Tomahawks coming near a Pantsir-S2 missile battery? The announcement of Europe’s Special Purpose Vehicle as well as Moscow’s own version of SWIFT are credible deterrents to the kind of financial bullying the White House has been used to engaging in for decades. And it all stems from the U.S. going nuclear on Iran in 2012 with Obama’s sanctions, cutting Iran out from SWIFT. And then there was the threats against Russia in 2014 over, what? Crimea. And now even that won’t work for much longer. A connected world is one that resists control. This is what passes for foreign policy these days. Cheap moralizing to protect unsustainable business models and imperial ambitions. So, this is why I opened with the history lesson. It’s all connected as one big web of cause and effect, action/reaction. And it’s why at the end of the day incentives matter. And as the Saudis are finding out now, bribes only work for so long. Eventually costs rise to the point where no amount of money in the short term can overcome them. Trump got a small win here. The U.S. will sell Germany some gas after these terminals are built. Merkel gets to pay her ‘fair share’ on NATO by overpaying for some gas while keeping her defense spending acceptable to the rising hard-left in Germany. But, the big winner ultimately is the Russian/Iranian axis that called Trump’s bluff on sanctions, tariffs and protectionism to flip Germany’s political incentives to their side of the ledger.